Welcome to the Terschelling diary, where you can read about my bird photography trip during the Easter break of 2011. Every year, over the Easter break, we spend a couple of days in the Netherlands. In 2011 we decided to rent a cottage on the small Dutch island of Terschelling. Terschelling offers everything for a family holiday from nice restaurants, beautiful beaches to endless cycling tracks. Of course it also gives me the chance for some bird photography, either early morning or late afternoon. Throughout our stay the weather was superb! For one week we rented a very nice cottage close to the dunes of Terschelling. Terschelling measures roughly 12 by 1.8 miles and i think you could consider it to be a small island. The countryside is a mixture of dunes, pine forests and polders. It is a Mecca for birds either during migration, spring or summer! 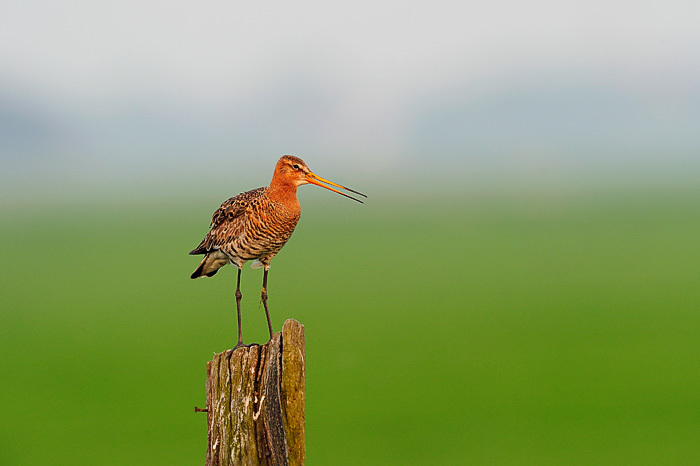 The variation in bird life is overwhelming and in many ways similar to what you can expect on the island of Texel. Waders, ducks, geese, raptors are all resident and during the migration period you can expect species like Ring ouzel, Merganser and Short eared owls. Getting to Terschelling is a bit of a trek. From the UK, it involves a night ferry and another full day (including another ferry) to reach the island. An added bonus is the fact that on the island you do not come across many other photographers unlike the island of Texel. We traveled to Harwich, where we took the overnight ferry to Hoek van Holland. It was a pleasant, relaxed crossing. We arrived at Hoek van Holland at 07.00 hours and made our way to Harlingen, the port from where the ferry to Terschelling departs. We took the slow ferry as it is the only ferry that has a car deck. The crossing takes approximately 2 hours. The weather was great and by 18.00 we arrived at our lovely cottage. I met up with Arie Ouwerkerk, a bird photographer who lives on the island. He showed me around some of the island’s hotspots. Although birds can be expected anywhere on the Island, Arie suggested to concentrate on two prime areas which proved to be the right decision. The Terschellinger polder, between Formerum and Hoorn is a great meadow area for all kind of waders, ducks and geese. The other area that Arie suggested was the dune area between West aan Zee and het Hoornsebos. This area is great for passerines, thrushes and harriers. It even has a couple of brackish lakes which are good for ducks and waders. In the car by 06.00, another glorious day! i started off driving the dirt track in the Terschellinger polder. Along the approximately 3 miles of dirt road, i took nice images of Redshank displaying on a wooden pole, as well as Black tailed godwit. There was a lot of activity, also among duck species like Gadwall and Shoveler, but they were rather difficult to approach. I also drove up to West aan Zee. It is worthwhile checking out the parking area but this time around it was very quiet. I did manage to get some nice flight shots of the resident Marsh harrier. Another fine day. i started off driving the road between West aan Zee and Hoornsebos. There was much more activity then yesterday. I managed to see Ring ouzels as well but there were no possibilities to photograph them. I took nice images of Wagtail, Dunnock and Marsh harrier on the parking area near West aan Zee. Near Midsland aan Zee are a few brackish lakes. It can be worthwhile spending some time here. Often there are ducks, waders and geese species. Especially when the tide is in. I drove down to Terschellinger polder and parked near the inundated meadow. Much to my surprise a Ruff turned up., a rather scarce bird in the Netherlands. i was able to take some nice images.I also got some good shots of Spoonbill and Shoveler. Further down the road, close to Landerumer kooi, i spotted a Peregrine. i managed to take some nice images. During the week i would see the Peregrine in the same area every day! How boring…..another fantastic day! i started off at Oosterend and drove along the dirt tracks in the direction of Formerumer Wiel. 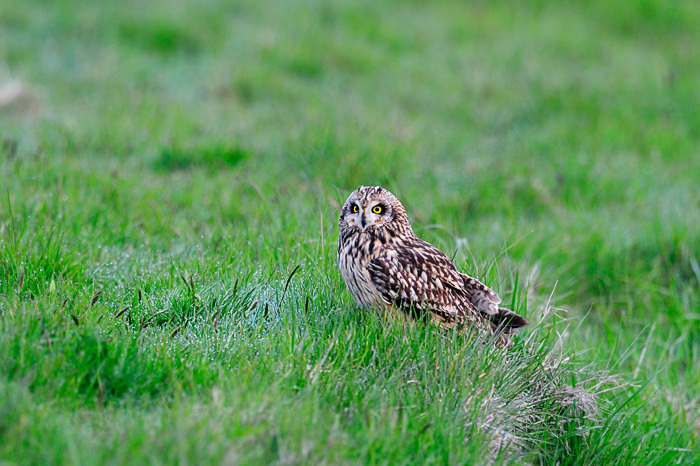 All of a sudden i spotted a Short eared owl next to the road, a rare bird on the island. i was able to take some nice images. the bird was constantly mocked by other birds and eventually flew off. I called Arie to tell him about it and he told me that he had never photographed the Short eared owl on the island despite living there for 10 years plus! i also took some nice images of Meadow pipit, Grey headed wagtail and hares. The weather remained beautiful. (It turned out ot be one of the best weeks of the year in the Netherlands!). i turned my attention again to the area between West aan Zee and Hoornsebos. I photographed a nice Marsh harrier next to the road. The parking area near West aan Zee was superb today! Singing Dunnock, Wheater and Shelducks were all within shooting distance of the 600mm. Back at the Terschellinger polder business was as usual. The waders like Redshank and Black tailed godwit were displaying and the male Godwits looked beautiful with their pink colored chests! The last full day of our stay. i kicked of in the Terschellinger polder but this morning things were somewhat muted. Maybe the birds were tired of all the displaying and were having a break! I did see a large flock of golden plovers roosting but too far out for any decent images. The hares were active and chasing each other around the meadows but again just too far out for some decent images. For my last evening i decided to start off at the dirt track near Hoorn. 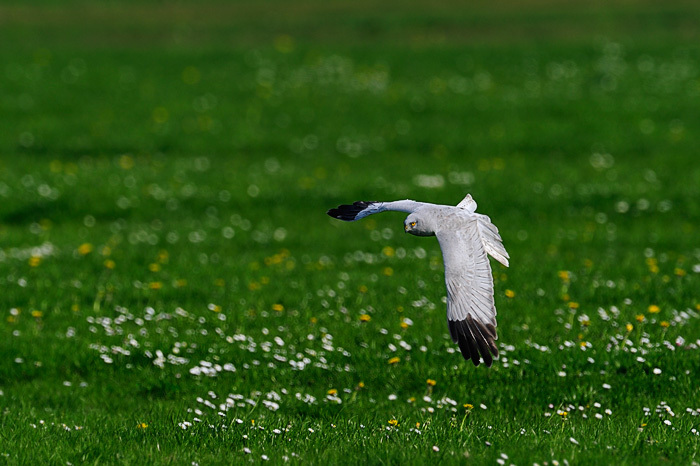 I spotted a male Hen harrier above a meadow, it obviously saw something as it was constantly hovering. The bird got spooked by cyclists and flew off but it soon returned and i was all prepared with the D3S and 600mm. The harrier swooped down and surfaced with a young hare in its talons! My camera was clicking away. What an experience. The harrier landed in a meadow a bit further off and was mocked by a crow. A fantastic week had come to an end. Terschelling is a fantastic island for bird photography. Even though it takes more then a day to get there from the UK! If you would like any further information, drop me an email. Happy to help! There are plenty of restaurants on the island. Expect to pay between £20-£30 for a meal. Supermarkets can be found in Midsland, West Terschelling and Lies. Equipment used during the the trip; Nikon D3S, Nikon D7000, Nikon 4.0-600VR, Nikon 2.8/70-200VRII, Nikon 2.8/24-70, converters, beanbag and tripod. For those of you who follow me on Twitter or Facebook, I will give advance notice of any website alterations.